within Waterlow Park in Highgate. The first edition will be inaugurated in May 2019 and run through October 2019. The display will bring together international artists whose practices appeal to a wide public inclusive of art and non-art audiences. The selection will include new and recent sculptures by artists with an approachable practice full of familiar references and situations infused with wit and playfulness. Additionally, ‘Art Without Walls’ will offer exciting opportunities for young people to engage with the project through a complementary participatory programme provided by our educational partner, Lauderdale House. Through a series of workshops, children and students will explore and creatively respond to the public space, landscape and sculptures. The project also reaches out to a wide circle of public art institutions, as well as patrons who support the project both morally and financially. 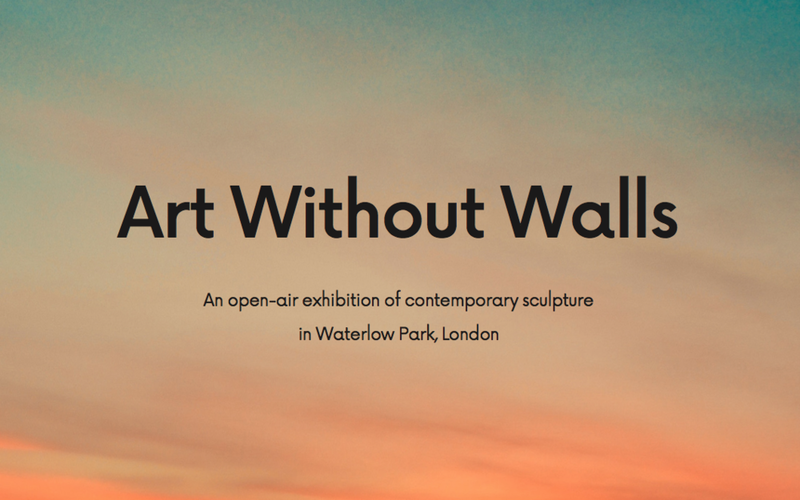 ‘Art Without Walls’ was founded by curators Louise Chignac and Lisa Slominski with input from the Waterlow Park Trust and London Borough of Camden’s Events Team. Both Louise and Lisa have experience with public art projects: Louise contributed to the first edition of Art Night, the largest contemporary arts festival in London; and Lisa oversaw major permanent public art commissions for Chicago’s mass-transit system. As curators they bring knowledge to oversee the creative and logistical aspects and are interested in developing a model that can be beneficial for the local community, the artists and all the partners involved. Sculpture in nature has a long history in Europe, dating back to the early Greek, even the Bronze Age. Sculptures were mostly found close to human habitation; they helped create a sacred landscape and were used for ceremonial rituals or as burial sites. In classical and Renaissance times, large gardens often owned by emperors and members of the aristocracy were complemented by sculptures. Such a tradition continued in the 17th and throughout the 19th centuries. Sculptures in private parks invoked authority by referring to classical traditions and mythology. In the 20th century, the interaction between sculptures and gardens became more sophisticated and self-consciously aware of their mutual relationship. In the UK, sculptors such as Henry Moore and Barbara Hepworth pioneered new approaches by placing their sculptures in nature and by making the open-air a new site for art. Between 1948 and the mid-1970s, the parks of the London County Council were frequently transformed during the summer months into ‘Open-Air Sculpture Galleries’. Initiated by Patricia Strauss, then Chair of the LCC Parks Committee, the project aimed at facilitating increased opportunities for the public to see sculpture. The first seven exhibitions were staged as a regular triennial series in Battersea and Holland Parks. The Yorkshire Sculpture Park, which opened in 1977, was the UK’s first sculpture park based on this very idea of a ‘gallery without walls’, with a changing programme of open-air exhibitions. With ‘Art Without Walls’, we aim to revive the British tradition of opener exhibitions of contemporary sculpture in London. We believe in working collaboratively with artists, communities and partners to create a unique project in Waterlow Park that responds to the history, landscape and needs of its local community.